A couple of weeks ago, I got this sunflower stamp set from The Ton. 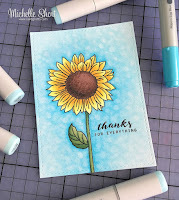 I immediately stamped, masked and coloured two sunflowers and then didn't know where to go next. The panel sat on my desk until I saw Michelle's card yesterday. I love how the crisp blue makes this card feel so happy and sunny. And I absolutely adore how Michelle created this bokeh-looking background with copics. So I pretty much copied it! Fortunately, I had just re-filled my colourless blender so it was juicy and ready to go! The blue looks like a fabulous broken summer sky. Beautiful sunny card Ardyth. Bright, beautiful & summery, Ardyth--love the blue background! Beautiful. The blue background makes the sunflowers really pop.